It’s a beautiful Saturday morning in mid-June in the central Appalachian Mountains. Today in the hills in the upper northeastern-most corner of Tennessee, the town of Bristol is playing host to a PDL (Premiere Development League) match between the West Virginia Chaos and the Charlotte Eagles. The PDL is the top-level men’s amateur soccer league in the United States and is sponsored by the USL (United Soccer League). The league consists of 63 teams in 10 divisions spread out over the US and Canada. Today there are 19 PDL games taking place. 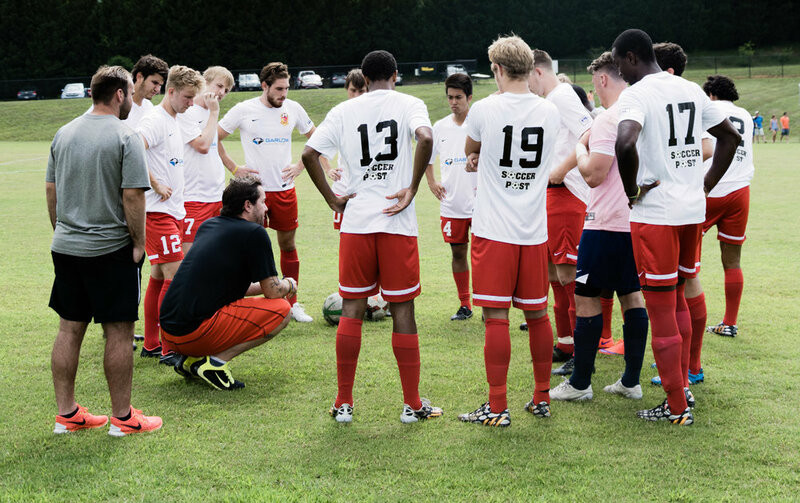 The players in the PDL are all high-level collegiate athletes attending NCAA Division I and II schools. For these student athletes this is an opportunity to continue training during off season and a test to play against elite competition. The West Virginia Chaos’s roster includes Ron McKelvey from Alderson Broaddus University in West Viriginia and players from Evansville University, Butler, and Missouri State. Sometimes the talent comes from much greater distances. Kieran Geldenhuys was born in South Africa, played for a club team in England and will be an incoming freshman at Butler this fall. The league is considered a training ground for the MLS (Major League Soccer). For some of these players, the dream of playing pro was born at an impossibly young age: “I've been playing soccer since I was three and a half years old; as soon as I learned how to walk I had a ball at my feet. 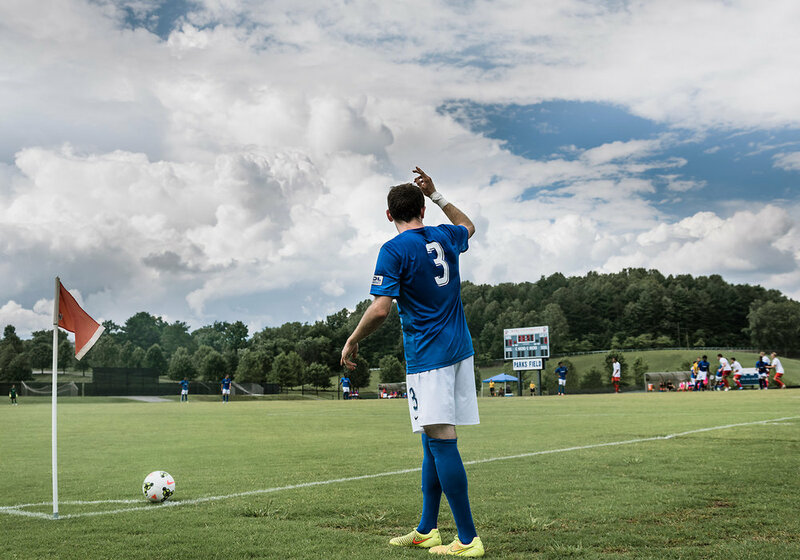 Its my dream, to be a home-grown player and make it straight to the MLS,” McKelvey explains. While the dream may be to play pro, most athletes keep that in perspective alongside other goals. "My long-term goal is to get drafted, hopefully, if it all goes to plan. If not I end up with a college degree," says Geldenhuys. The team plays with a lot of energy in the second half but misses a few opportunities to score and the game ends in a 2-0 loss for the Chaos.As the sun starts to fade in the western sky, the team heads back to Charleston. They arrive home just before 11pm, more than twelve hours after the journey began. The air is thick and humid on Tuesday afternoon as the team runs through its two-hour practice at Schoenbaum Stadium in Charleston. Ominous clouds pass overhead momentarily blocking the sun. After practice, the team is surprised when Coach Phipps says he wants another practice the following day at 6:30 am. The next few days are key preparations for the Friday night road game in Greensboro, NC and he explains that the team needs to utilize all its available downtime. At this point more than halfway through the season everyone is slightly fatigued. Even a slight injury seems to create complications for upcoming games, though the lifelong dream of taking their passion for the game to new levels seems to drive each of them to endure and move foward. "I’m not going to stop playing soccer until they drag me off the field,” says McKelvey.